Looks delicious, Reid. What's li hing mui powder? Thanks for dropping by the site. Li hing mui is a type of Chinese preserved plum. I believe ling hing mui powder is the made from the actual preserved plum itself. Either that or it's the "spice blend" that's used to flavor these types of dried plums. It's actually a combination of different flavors: sugar, licorice, salt and star anise, among others. Here's a website that you can visit for more information on "crack seed". This shop is located at the Ala Moana Center and sells many different types of li hing mui snacks as well as other types of preserved seeds. Looks good. I miss having sweetened condensed milk. Great for bevarages like coffee and tea too. Too bad they don't have it here. At least my weather is much better - it's just awesome at the moment. 23 celsius daytime and 10 degrees at night. Is that Chinese scroll banners I see on the sides? What? No sweetened condensed milk in Korea? Why not? You're definitely missing out then. I'm glad the weather is so nice there. Snow coming soon? I wish it would start to cool off here already. Would be nice to get some rain so that we would lose some of the humidity, but then again, this is nothing compared to Southeast Asia. Yes, those are Chinese banners on the sides of the registers. The owners of this shop, and the original shop, are Chinese. First time on your site. Great blog! Never been to Hawaii but it looks like there's some good food down there. Welcome to the site. I'm glad you enjoy it. You should take a trip to Hawaii when you have a chance. Besides the wonderful weather, there are actually some very nice places to eat, especially if you like Asian food. Hope to see you again! I've never been so jealous over someone living in Hawaii as I have been at the sight of such tasty looking shave ice. :) The local shack closed down for the year, so I'm missing it! But we can't get the interesting flavors and add-ons here - mochi? Mmm! Yep chendol with durian is pretty awesome. I believe the fad started in Melaka, Malaysia. But strictly for durian lovers I guess. Reid, been meaning to ask you for ages, but always slip my mind. I have never known Hawaii to be so Asian-influenced and Asian-populated. Your blog has proven to me otherwise. Thanks for stopping by the blog. We actually have a lot of shave ice places here in the state. When I have the time, I'll be blogging a bit more of my favorite places. By the way, where are you from? If they've already closed up shop my guess is that it's somewhere cold. The flavors and the add ons are just the best. I like mochi balls, azuki beans and ice cream every now and then, as well as condensed milk and chocolate syrup. As far as flavors, you can get passion fruit, lychee and even green tea! We do have a wide range of choices and I guess that's why people like it so much! Hope to see you again! I envy the fact that you actually got to have some when you were in M'sia earlier in the year. I've been trying to find the mung bean flour as I have a recipe for chendol. Asian migration to Hawaii came in waves, first starting with the Chinese in the 1850s, then the Japanese in the 1880s and finally the Filipinos in the early 1900s. There were other periods of immigration to Hawaii by other ethnic groups, but they were not as substantial as the 3 listed above. Most of the migrant workers came to Hawaii to work (as contracted laborers). Many labor camps were set up throughout Hawaii to harvest both sugar cane and pineapples. Sorry for not being more specific, without going into too much more detail. Li Hing Mui! :) I remember as a child, running to get a 20 cent popsicle that was made with sour plum - like li hing mui. mmmm thanks for the time trip back :) that looked really good. Nice to see you again! This is really good, but I think it would have been better with the li hing mui syrup. Too bad they don't have it anymore. Thanks for dropping by the blog. I've never had the ube bread here, but I've seen it. It looks good too. I might have to try some on my next visit. Yes, I do go to the original location in McCully and was actually going to go there today! Hope to see you again! your postings makes me want to fly over to hawaii. lol! I love the pictures..!! Yummielicious..!! Perhaps you should come visit Hawaii. I'll be glad to show you around and take you out for some shiok eats! Thanks for stopping by and thanks for the compliment. This was yummy! In fact, if I could, I would have this every day! Hope to see you again! i could eat at least 3 of that! ;-) the colour looks really inviting. wow. i never know you could have mochi ball with shaved ice. it must be a japanese thingie? sounds very interesting. hawaii has so many interesting thing! i also love condensed milk on my shaved ice. your post reminds me of ice kacang back home. rose syrup and evaporated milk on shaved ice is one of my favourite! Oo-o-o nice pictures Reid! Never been to the Waiola Market on Kapahulu Ave but pass it constantly traveling toward Kaimuki. We usually go to the other Waiola Market near McCully and King Sts. for shave ice which my wife loves the best of all. Even better than Matsumoto's in Haleiwa which in my opinion is way overated. I remember shave ice used to cost 15 cents back in the old days...that's really dating myself! I could eat a lot more too...believe me! =) Actually, you could be right, although, most of the shave ice places that I frequent are owned by Chinese, including this one. I can't wait to try ice kacang, I heard it's really good! Nice to see you again! I did actually go to Waiola Store in McCully just a couple of days ago. I normally like the one in Kapahulu better because it's easier to find parking! =) Yes, I think that Waiola is better than Matsumoto's if only because of the fine-ness of the ice. The cheapest I remember shave ice being is 25 cents, that was back in the 70s at M&S on School Street near Frog Lane. Hahah I love that place; and it's right in town! I thought it was way better than going all the way to Haleiwa to go to Aoki's or Matsumoto's .... ice seems finer, somehow. Hey Reid, are you from Malaysia or Singapore, by any chance? Keep up the good work on the website! Thanks for stopping by. I like it too especially since it's in town. The location on Waiola Street is only 10 minutes away! 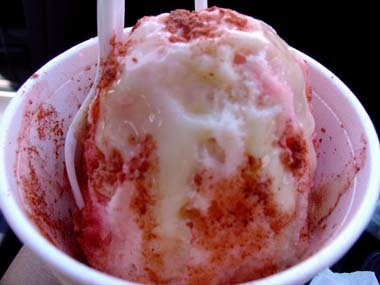 I think Waiola has much better shave ice than Aoki's or Matsumoto's only because I like the finer ice. And no, I'm not from M'sia or S'pore. I was born and raised here in Hawaii. Thanks for your compliment on the site. Hope to see you around again! Your posts has been striking numerous chords all over me when you mentioned "Frog Lane". Haven't heard that name in decades. My father lived in Damon Tract on Buckle Lane but then that's now the Honolulu Airport. 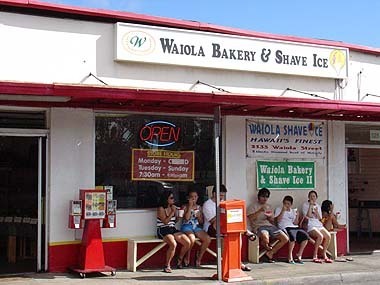 Anyway, one of the best shave ice when I was growing up was this little mom-and-pop place on King Street next to an old Japanese Church or Temple. All I remember was the big green pine trees out front with lots of pine needles with prickly little pine cones on the ground that hurt when you stepped on them with your bare feet. 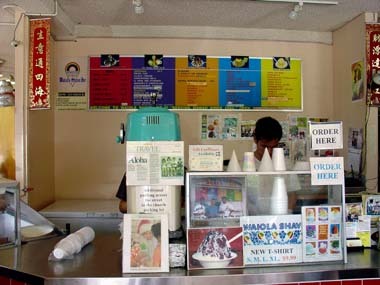 The shave ice was packed in white paper cones about a foot high. Being a kid, we always got the rainbow flavor but the adults always got the usual strawberry. You're right, the fineness of the ice makes the shave ice...not like the kind they used to serve at the old Honolulu Zoo where we refered to it as eating "watermelon seeds".